Pathfinder Personnel sister company SCH have added another notable first to their passenger ship credentials by handling the world’s largest cruise ship, Harmony of the Seas, on her maiden voyage to the Port of Southampton. 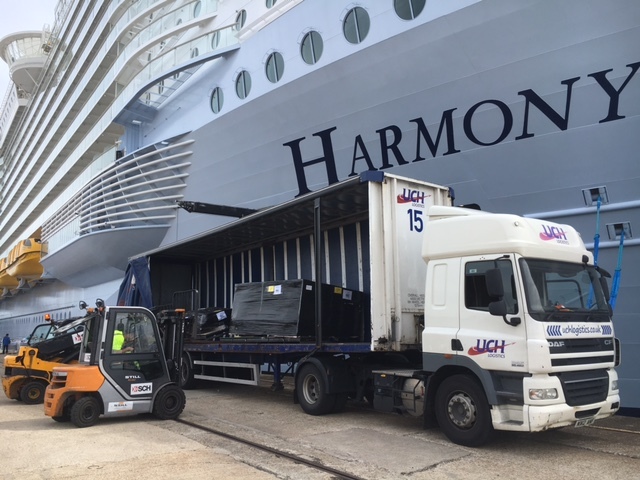 Cruise terminal operators SCH provided a range of services from mooring to stores loading and baggage handling as Royal Caribbean International’s exciting Harmony of the Seas made a series of short cruises from Southampton before she deployed to her home port in Barcelona for the 2016 European summer season. The new 227,000 tonne ship is approximately two metres longer than her two sister ships of the RCI Oasis Class and can cater for over 6,500 guests on her 16 decks. SCH provides support services for all RCI ships calling in Southampton and this season will regularly handle Independence of the Seas and Navigator of the Seas, operating their European itineraries from the south coast port.